In today’s episode we bring you the revealing story of how Baba on one occasion assumes upon Himself a deadly illness for the protection of His devotee. His abrupt recovery occurring moments before He is scheduled to address thousands not only relieves thousands from Himalayan sorrow but also proffers concrete proof of His superhuman glory. It was in December 1970 when Late Prof. Kasturi had received permission from Baba, weeks ahead, to accept an invitation to visit Sri Lanka. 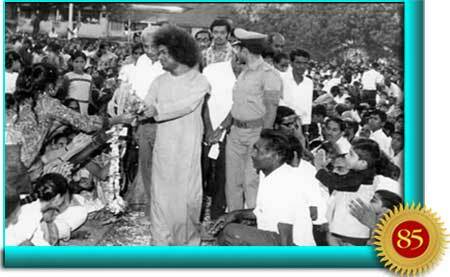 He was looking forward to sharing his Sai experiences with devotees there. 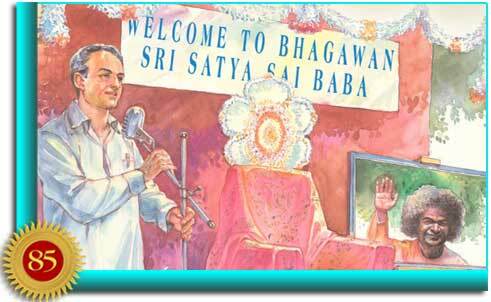 His passage was booked and on the eve of his departure he went to Baba with baggage in hand to receive His blessings. Baba asked him where he was going. To Sri Lanka, Kasturi replied. The abrupt change of plans initiated by Baba was a portent of the drama to come. Everyone wondered why Baba who withstood worse roads better was insisting on slow driving that day. It was already night when the cars reached Goa. They were met at the border by Goa’s Lt. Governor Nakul Sen. Baba entered His state car and with the other cars following drove to the Governor’s palace. June continues: “We had motored 385 miles since morning, over good and bad roads. Baba looked lithe and lily-like when He hastened up the red-carpeted flight of steps, 28 in all, to the flower-decked apartments, set aside for His stay. Very soon, Baba presided over the dining table to which we were led by the Lt. Governor. In her narrative, June Schuyler continues: “Next morning, it became clear why He had abstained from dinner, postponed the coffee hour, and wanted only to hurry away to bed. I knew why He had taken the driver to task. Obviously, He had been ‘ill’. No one could be definite about the illness; there were too many experts and Baba was amused at the conflict of their diagnosis. The Sens were aghast at the turn of events. 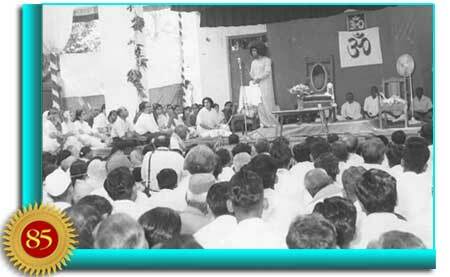 For among other reasons, the local Sathya Sai Seva Samithi had announced that He would deliver a discourse at the large maidan in the heart of the city at 5.00 p.m. that evening. Meanwhile, pain, nausea and fever kept Baba in bed all day. Information came that 20,000 people had gathered in the maidan, awaiting Baba. Half the number had come from far off villages. Baba tried to rise and don fresh clothes to keep the appointment. He did not want to disappoint thousands of people. But the palace had no lift. To reach the location, Baba would have had to go down 28 steps and walk some distance in order to give darshan to the people. And then, climb the few steps of the dias. Of this, June Schuyler writes: “Baba's door opened! Mr. Kasturi came out! Why Mr. Kasturi? Why not Baba? We sat sadly, watching a large blood-red sun sink into the Indian Ocean." The gathering heard Kasturi’s announcement with wonder and amazement. They had heard many stories of Baba and His miracles, but this mystery of taking on an illness and saving a devotee from its consequences was something they had never heard, nor imagined possible. Could such compassion exist? How does Baba assume the illness and, how does He rid Himself of it? How has He done it in the past? Many sought Kasturi for the answers. He told them of the great Guru Poornima miracle, when Baba took upon Himself the cerebral thrombosis and heart attacks of a devotee. Withering under the illness for eight long days, he was literally carried out before 4,000 people, a contorted form of the Sai Baba everyone knew. Then while the crowd watched he became in a moment, His fresh, free and full Self. Rescuing the good is as much the mission of the Avatar as chastisement of the wicked. He atones for the karmic debt of the devotees when they plead sincerely for grace, Kasturi said. That is the measure of His divine compassion. The press approached the doctors, anxious to report the reason for the postponement of the public meeting. They were alarmed at the news of the illness of the world-renowned personality. 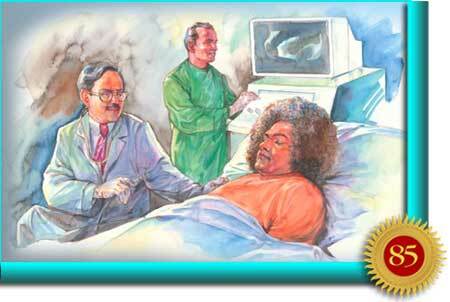 The doctors told them that Baba was suffering from an acute attack of appendicitis. This news was flashed all over India and spread through the early morning editions and the papers issued from Bombay, Delhi, Calcutta, Madras, Bangalore and Madurai. Telegrams and telephone calls poured in from all over the country, praying, pleading, denying, disbelieving, hoping, weeping and wailing. There were many offers to accept the 'illness' from Baba; some devotees said they would fast until Baba was free from the illness. Devotees having firm faith in His divinity were convinced that just as the illness had been taken on miraculously, it would be thrown off mysteriously too. June Schuyler writes: “Mrs. Sen confided in me that she has been praying all day to Baba asking that she be allowed to share the pain. We all caught this idea and trooped into Baba's room with the same request. He sent us back, saying: ‘I do not feel any pain and even if I do, I am never in the habit of distributing pain as prasadam’. “Suddenly it flashed on me that Mr. Kasturi was asked to cancel his engagements in Sri Lanka and join us on our journey to Goa precisely for this reason. To spread assurance, whenever doubt raised its fearful hood! His role was to laugh the serpent off, and to restore courage. 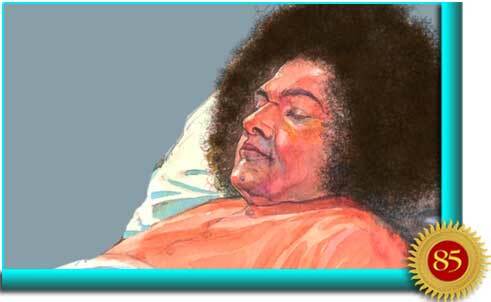 Tell us about the time when Baba took on the paralytic stroke, we begged, and Mr. Kasturi with genuine enthusiasm, plunged into that story of the eight appalling days and nights, the sudden doffing of the cruel symptoms, the final triumph! The infinite compassion - the infinite power! “I became aware that Mr. Nakul Sen was motioning to us to step inside the doorway of Baba's room. We crossed the threshold half expectant, fixing our eyes on the bedstead where the Master was suffering. He was not there! He was standing before us, feeble and frail, with eyes full of love and mercy - charming in spite of it all. He drew back the orange robe, and permitted us to touch those precious feet. The lovely feet were warm because of the fever. The beloved face was pale and etched with pain. The cheeks had been hollowed for want of sleep and refreshment. But He stood there for our sake. "Do not worry," He said tenderly, in a soft, soothing voice, "It is a little upset, that is all," indicating the right side of the body. On 9 December, the doctors decided to put tubes down the nose to relieve the hiccough which was complicating matters and for taking the gas out of the stomach. They also talked of the urgent need that had arisen to puncture the lump and syringe off the pus from the abscess. The hiccough must have caused a terrible gash of pain for Baba, for it pulled the muscle tight and affected the lump round the inflamed appendix! However, the doctors left with their tubes and bottles, as Baba refused to accept their proposals. The Divine Magician Waves His Magic Wand! 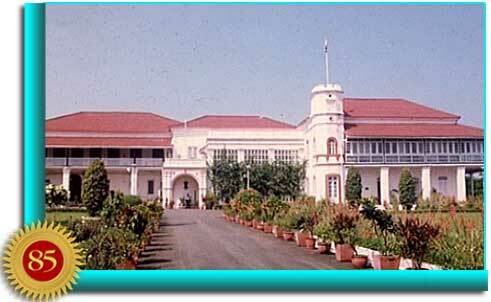 On the 10th, a bhajan meeting had been announced at Government House and word had gone round indicating that Baba would attend the meeting! Baba too said: "Yes! Arrange it." The doctors could not believe their ears. They did not foresee any possibility of a public appearance that day. There was doubt, wonder and amazement in the minds of various people, with a few believing that whatever He says will come to pass. At tea time, Mrs. Sen looked rather serious, as time was running out and already people were streaming towards the meeting place. Goa, which had been previously shocked by the news of the agonising illness, was now jolted by the impact of such good news. Baba's condition may be described in His own words: “The doctors were unanimous that an immediate operation was necessary, or they would not be held responsible for what might happen. They said the inflamed appendix had burst, and the pus had entered the blood - a situation that is fatal for all mortals!" 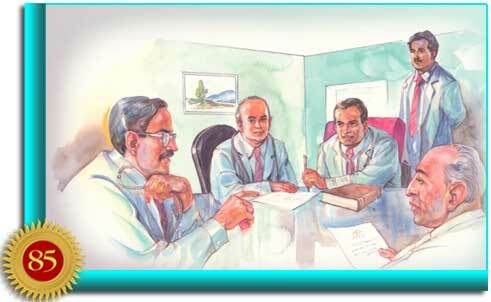 The doctors were in panic; they were absolutely against Baba attending this meeting. Realising that Baba could not be dissuaded, the chief of the medical team began to devise ways to make His physical effort easier by lessening the distance He would have to walk using short cuts, and by removing the dais He would have to climb. 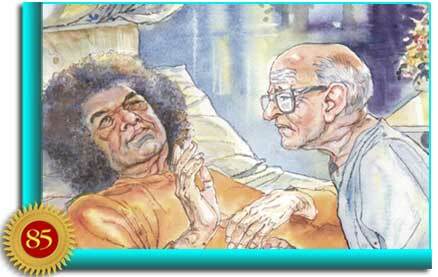 At 5.00 p.m. Baba was led into the bathroom, and twenty minutes later He came out of it, clean shaven, wearing a new robe! Fresh as a new blossomed rose! When the doctors examined Him again, they could not locate any abscess, nor could they find any trace of the big lump of flesh near it. The whole area of the appendix was as soft and as normal as it could be. Baba's eyes which plumb the depths, His eyes which pour out love and compassion, His eyes which flash when he speaks of cruelty, falsehood, hypocrisy and injustice, eyes which can be full of laughter, were as eloquent as ever. He took His place on the divan in front of the gathering and kept rhythm with the bhajan being sung, with His head and hand. Isn’t the Lord Beyond Mere Physical Illnesses? Baba spoke of the significance of the illness and its role in the Avatar’s mission: “There are many who doubt the existence of God, or dismiss the idea of God as a silly outworn superstition. To make them discard their conceit, the Divine reveals its superhuman glory. The doubters receive the reply without asking, the door is opened without even a knock. For those who deny will not knock. The ‘superstition’ will be raised to divine status by a concrete experience, an indisputable fact. “The human body generates diseases as a result of faulty food or frivolous habits, or foolish rashness or fanatic emotions. The illness that was witnessed by you during the last two days was quite different. That was an illness taken over by Me, voluntarily put on, in order to save a victim who could not have survived it! His continued existence, in good health is desirable for the task dear to Me. 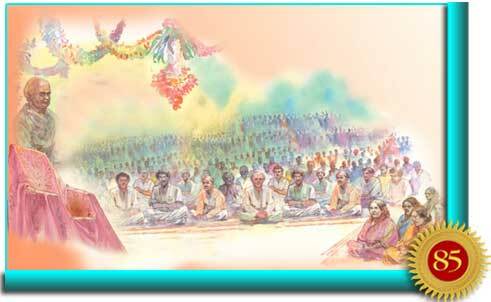 Pouring grace on the devout is one of the functions of the Avatar. The appendix was inflamed; it turned into an abscess which the doctors could cure only by removal. He could not have survived it. I have come with this Body in order to save 'other bodies' from pain. This Body is ever free from pain. Disease can never affect it. I had to go to the rescue of a person who had surrendered to Me even his judgment. I took over his illness and went through it. It shall not recur again in him. The drama Baba brings to the world stage thrills those who have awakened to the Supreme Truth, and challenges the doubters and critics to perform the impossible task of making reasonable that which is beyond reason. Only awe and wonder can adequately describe our experience of the Avatar.